If you’ve never heard of scapes, I’m sorry for the information I’m about to give you. I’m sorry because after you taste one of these curly, crazy looking little plants, it’s entirely possible that you might form the same attachment that’s about to send Mark and I back to the farmer’s market to rush the poor farmer that sold them to us… lest you (and we) tragically miss all of scape season, which is just a few weeks at most. So what are these things? Upon asking said farmer what the moderately creepy, spidery little plants were, I learned that scapes are sort of to garlic what scallions are to onions. 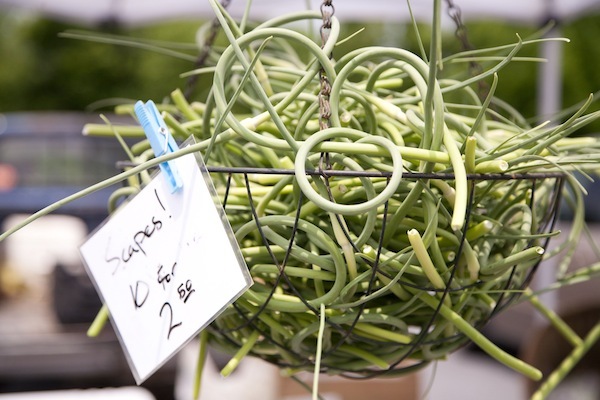 Scapes grow up out of the garlic plant before it’s fully formed, then begin to harden and curl around themselves until eventually, if they’re not cut off, they straighten up straight to the sky in a move that signals the garlic is done. Of course… you’d have to be crazy not to cut them off. First, cutting your scapes will apparently give you a bigger garlic bulb (oh the things I’ve learned about garlic farming on this adventure… I’ll be a pro by July) and second… If you don’t cut them you can’t eat them. And why would you ever do that? Scapes have a delicious, mild garlic flavor with just a little bite and a fresh taste that can’t be compared to anything else I’ve tried. They can be sautéed in butter and olive oil, mixed into your stir fry or sauce, pickled and jarred, and I imagine just about anything else… people are making ice cream out of ramps these days, you know, why not try it with some scapes?! It couldn’t possibly be any less weird. But one of the most popular ways to prepare your scapes (and freeze and keep them too) is to blend them up into a pesto that I could barely help but eat off the spoon. 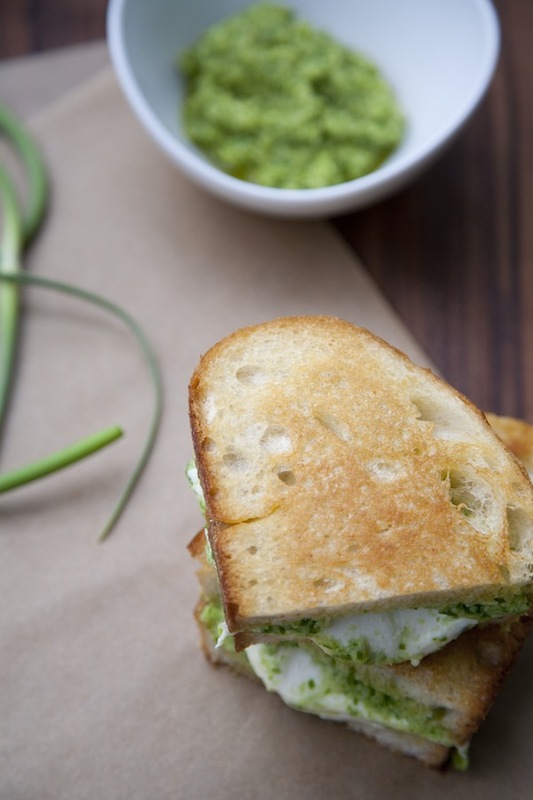 Then, if you’re really feeling decadent… you can pull out a little sourdough and fresh mozzarella and make this sandwich. 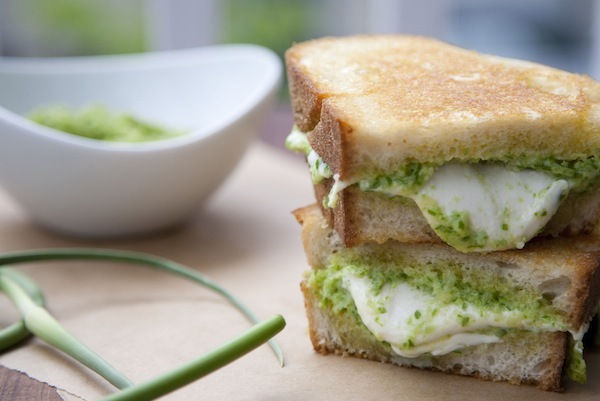 For one sandwich: Butter two slices of sourdough bread on one side and smear with a generous amount of pesto on the other. 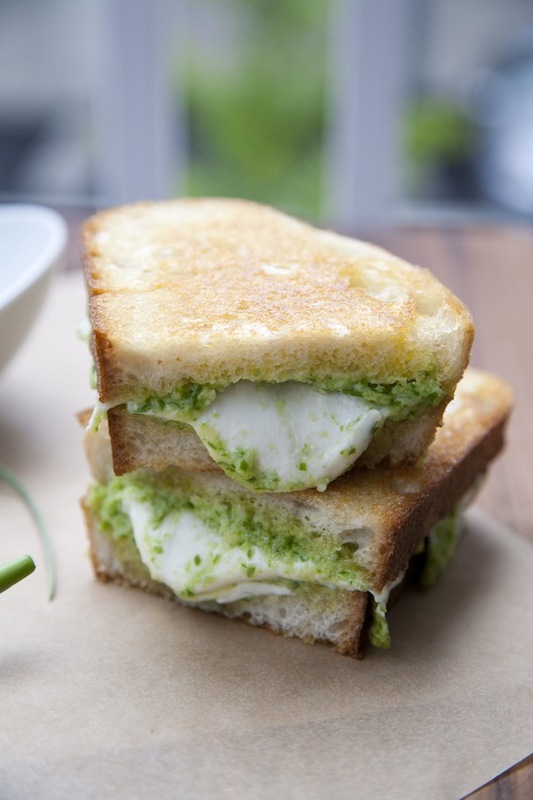 Place an equally generous amount of mozzarella between pesto-smeared sides and toast over medium heat to taste. Pesto can be stored in the refrigerator for a couple of days or packed airtight and frozen for a couple of months. I recommend you stock up! I have never heard of scapes but, oh boy do I want to eat them! This sounds amazing. Thanks Christine! I hadn’t either but man am I happy I know about them now… so good. this looks and sounds absolutely amazing!! got to get my hands on some scapes and try this out. just wanted to come back and let you know that I dragged my boyfriend to the farmers market for scapes and it was so worth it! we substituted mozzarella for gruyere. sooo delicious. Oh I’m so glad you did!! Aren’t they amazing? I’m totally obsessed with that pesto now. And gruyere sounds delicious — yum! Oh man does that look tasty! My husband is a huge ramp fan, and I’m sure scapes would be right up his all. Great post! Thanks Sarah!! 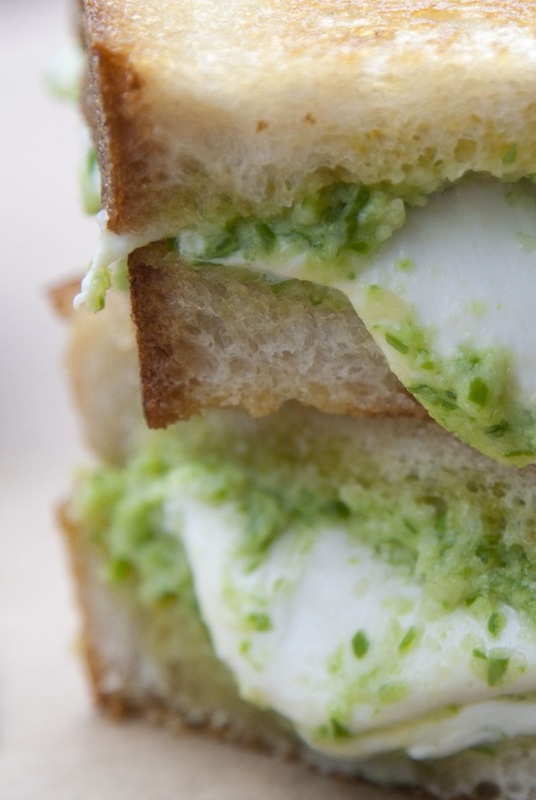 I’m sure you guys would love them — I kind of want to put that pesto on everything now. That Looks AMAZING! My co-worker was just telling me about scapes, I cant wait to make this for my wife. oh man, this looks incredibly tasty. modern comfort food. Oh… my… word. Off to find so scapes… and tons of mozzarella… bye! This looks insanely good. I’d like one for breakfast! I wonder if our local farmers market carries them.. I haven’t seen them, but your post has me intrigued! my mouth starts to water !